Since Jamiroquai started, one radio station, Kiss 100 FM, have been fully behind them giving them huge support in London. This section of the site will give an insight into the station behind the music. "Kiss FM have to be the most talked about pirate in recent years. After nearly three years of illegal broadcasting they closed down on New Year's Eve 1988 to apply for a license. The first time they were narrowly beaten by Jazz FM. They campaigned for more licenses, got them and then won one! Unfortunately, no-one bothered to tell Kiss MD Gordon Mac who eventually heard second-hand from a journalist! The new, legal Kiss is split into two halves. Daytime during the week is designed to bring in the listeners and features what Kiss describe as `the most exciting playlist anywhere on radio'. Evenings and weekends are more like the old Kiss, with more specialist shows hand-crafted by individual presenters. There are no words to express the way I feel at this moment. So, with your permission, I'd just like to get something out of my system. AAAAAAAARRRRRGGGGGGGHHHHHHHHHHHH!!!!!!!! It's taken 59 months, and 465,720 working hours, plus three and a half million pounds as well as all of your support over the last five years to reach this moment. From today, London and everyone within and around the M25 will have their very own 24 hour dance music station. I'm talking to you from our new studios in Kiss House, completely different from all the dodgy studios we've broadcast from in the past. The odds were against us. None of the establishment fancied our chances. But, with the force of public opinion and our determination, the authorities had to sit up and take notice. In keeping with tradition, here is the first CHOON! 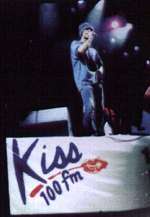 Kiss 100 FM Managing Director and specialist DJ, Gordon McNamee's (Mac) first words on Kiss as the station came on air at twelve noon on 1 September 1990. The following weekend after the launch of the station, a celebration was held at Highbury Fields where, only a week into Kiss 100, over 150,000 people came to party. Less than a year after it went legal, Gordon Mac sold half his stake in the station to media company EMAP - which helped launch the station. EMAP now have the top radio stations in all the big cities in the North West Yorkshire and the North East, as well as Kiss 100 in London and Red Dragon in Cardiff, taking a leading share of UK commercial radio listening. "Remember......if we're too loud, you're too old. Keep it tuned in to Kiss 100 FM....turn it up." When Jamiroquai released their first single When You Gonna Learn? on the Acid Jazz label, the inner sleeve credits said "Many many thanks to everyone who has supported and hopefully enjoyed Jamiroquai and helped keep the spirit of live music. They are ... Norman Jay, Giles Peterson, the lovely Lisa I'Anson and everyone at Kiss FM. DJ Trevor Madhatter who played the tune first (full respect to that)." Although Kiss FM now only has Giles Peterson from the above list, they are fully supportive of Jamiroquai and have promoted their London concerts for many years. Kiss have promoted Jamiroquai ever since the release of their first single, and the band have appeared on the Kiss stage at the Notting Hill Carnival in both 1994 and 1996. At the London Forum concert of 10 November 1996 as part of the Travelling Without Moving Autumn tour, Jay personally said thanks to Kiss FM, "for supporting us since the very beginning". At the beginning of April 1997 Kiss FM opened a internet web site. For the full picture, point your browser at www.kiss100.com. "As Kiss 100 goes from strength to strength, we realise that we would not be here without your support, and for that we thank you. Keep listening, keep writing to Kiss 100, ......turn it up."